Snails in Paris? Why not! While abroad, I had to take care of myself. Yes, I had either program or Babson resources available if I had a question, but I learned to operate and solve problems on my own. Lost in Venice with only an Italian phrase book and no one speaks French or English? No problem! I have to register at the Sorbonne in person and all in French? Sounds fun! The taxi in Sekondi has broken down and I need to negotiate for a new one? Bring it on! I learned to be self-sufficient and use my skills to solve the problem at hand. Education abroad is a phenomenal chance to push the boundaries of your comfort zone and to explore your passions. While I was in Paris I did a marketing internship with a French-American Cooking school. I love marketing and I love food so it was a perfect chance for me to see how a business in France operates first hand. I was able to put my marketing skills to the test and to learn about French culture through food. 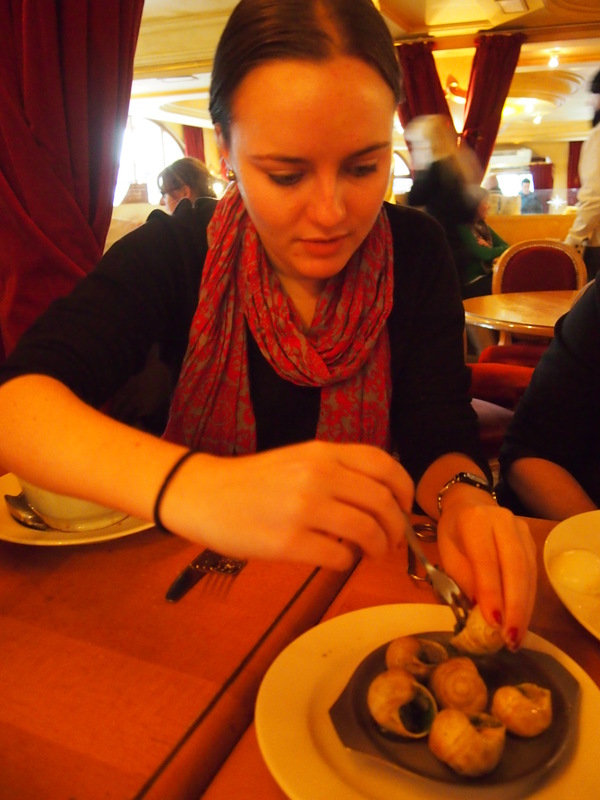 I tried foie gras and escargot and I now I love them! You’ll never know what you can accomplish if you never allow yourself to take advantage of every opportunity. 3) Exploring the world is the best thing ever and the more you travel, the more you want to travel! I have been lucky enough to have set foot on 4 continents (North America, Europe, Asia, and Africa). Hopefully I’ll be able to travel to South America and Australia sooner rather than later! And maybe one day I’ll go to Antarctica but that is not at the top of my list. Sharing my Education Abroad story and hearing about my peer’s experiences has made me want to explore more of the world and see what it has to offer. Employers also love seeing that I am not just a dual American and Canadian citizen but that I am a citizen of the world. With the language skills I gained in Paris and my experience teaching entrepreneurship in Ghana, I can set myself apart in a global marketplace. Brett is originally from Southern California and is an Education Abroad Advisor in the Glavin Office of Multicultural and International Education. He advises for semester and academic year programs in Asia, Europe, and the Middle East. Brett has traveled to every continent except for Antartica. He enjoys running, traveling, and trying new food!